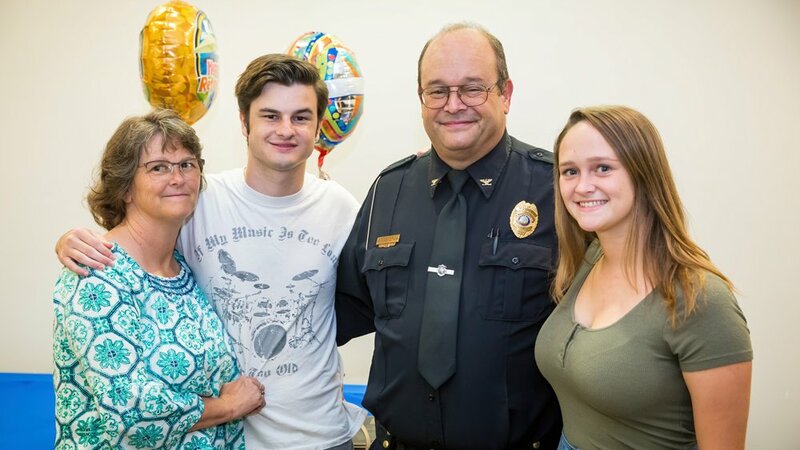 WINTERVILLE—After nearly two decades of working to provide a safe campus environment, Pitt Community College Police Chief Jay Shingleton has called it a career. Shingleton, a member of the campus police force since May 2000, retired July 31, handing over the baton to Officer Tyrone Turnage Jr., his friend and colleague the past nine years. In tribute to Shingleton, Turnage was sworn in as PCC police chief during his former boss’s retirement reception on campus. As it turned out, Edwards was spot-on. PCC Vice President of Administrative Services Rick Owens said whenever tensions ran high, Shingleton “willingly stepped forward to provide a steady, calming hand” throughout his law enforcement career. Shingleton says his future plans include traveling with his wife, Kristi, and spending time with their three children.